The Gandhi family must really stop this whole 'sacrifice' rhetoric - the media must also do its bit! 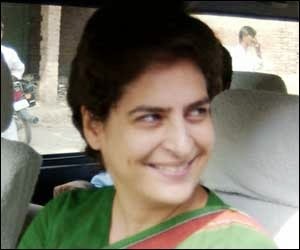 I was watching the news last evening and saw Priyanka Gandhi talk to a TV person. She was talking about how Varun Gandhi had 'betrayed' her family. Her contention was that Varun Gandhi's speeches some time back were very divisive. Then she said those magical words, "My father died for the unity of this country and I cannot forget that!" I am sorry she lost her father at such a young age and I completely sympathise with her loss and genuinely feel that no youngster should go through this terrible time. However, to say that Rajiv Gandhi sacrificed his life for the unity of this country is to take things too far. Similar claims are repeatedly made by Sonia Gandhi and Rahul Gandhi. Did Indira Gandhi and Rajiv Gandhi really give up their life for the unity of this country? They were assassinated, obviously against their will. It was not like they were fighting at the borders of the country or in a counter-insurgency operation and they lost their lives. Why then does the Congress always use this 'sacrifice' theme? I guess it tugs at the heartstrings of many gullible voters. It sounds really vulgar that the Gandhis still use their personal loss to pursue selfish interests. The media encourages this as well. By the way, the level to which media debates have degenerated to these days is appalling. I have stopped watching Times Now. All they have every evening are shouting matches where you can hardly hear a single word. NDTV is more civilised. Yes, I have read a lot of criticism of the way NDTV colours their news against Modi and the BJP. Well, Prannoy Roy was given a Padma award by the Congress government some time back. Obviously he must have done something for them to deserve this! The internet and the television media these days are full of opinions rather than news. When I watch a news channel, I want a thoroughly accurate representation of facts without the personal biases of the newscaster to colour the news. Unfortunately all we hear these days are the personal views of the television channels. When it comes to Modi as well, the internet is filled with views and 'facts' from both sides of the Modi divide. Many people make up their mind based on these views. That is a dangerous trend. The internet is filled with dubious material. We must learn to differentiate between reliable sources and personal viewpoints. I myself get confused after reading articles about Modi by different people. Sometimes I feel he could be good for the country and then sometimes, I swing the other way. Currently I think I am going to go with NOTA for both the assembly and the Lok Sabha! Every media channel has some political affiliation or one of the poltician own them. Look at AP state news channels, all are sold to some political parties. There is no need channel which is immune to paid / biased need. I agree with you, it was ridiculous to see media channel to publicize Varun and Priyanka related activites. This was shown as national importance. Go through both the parts.